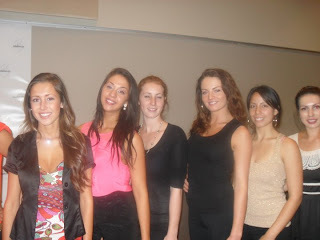 Global Beauties correspondent in New Zealand, Nick C, bring details and predictions of Miss World New Zealand 2010 that will be held on April 3 at the Sky City Convention Centre. Just came from dress rehearsal. It is a done deal. Cody Yerkovich will be crowned Miss World New Zealand tomorrow, unless something extra ordinary happens. She is tall, striking, and she has an aura which I have seen last in Unnur Birna. She will put New Zealand back into the map. In addition, she has a very pleasant personality. It turns out that she travelled 6 hours every week (and back) from her hometown up north to Auckland for the rehearsals. She is a perfect ten. She is of Croatian, German and Maori descent- a very interesting mix of genes. Miss New Zealand Tourism Queen will most probably be Ina Ivanova. She is not very tall- only 5'7' , but she is very polished and eloquent. She has a trim body, a cute face, she knows how to walk, she knows how to talk, she knows how to smile. She is really a decent girl- a volunteer for Unicef, a university student with good grades. Miss New Zealand International will most likely be Emma McDonald. She reminds me of a prettier version of the current Miss USA, Kristen Dalton. Her interview skills are extraordinary. She has a beatiful face, an amazing figure- and she is the most polished of all contestants. Her only downfall is her height- she is only 5'6' tall. So, especially in the evening gown section, she gets lost on stage. Others that can make a surprise include Olena Poltavchenco, who is a very sweet girl with a beautiful face without the best swimsuit figure and Dominique Wisniewski a swimsuit model with a great figure. But those two have lower chances compared to the former three. Special Thanks to Nick C and Global Beauties' Patrick Tripoldi!